Starting with version 2016.7.11 (Released July 11, 2016) (Download), you can now synchronize an Active Directory Organizational Unit directly with a managed group in Bozteck VENM Remote Desktop Manager. This makes it so much easier to keep your computers up to date inside of the Remote Desktop Manager. The background scanner will look at each group to see if it is configured to sync with Active Directory. This setting is configured in the Group Properties window shown below. The background scanning feature will scan all of your groups that are configured for AD Sync and add any new computers that were added to the OU since the last scan and remove any computers from the group that no longer exist in the OU. The computer description in Active Directory is copied into the Comments field in Bozteck VENM. It is updated with each network scan. 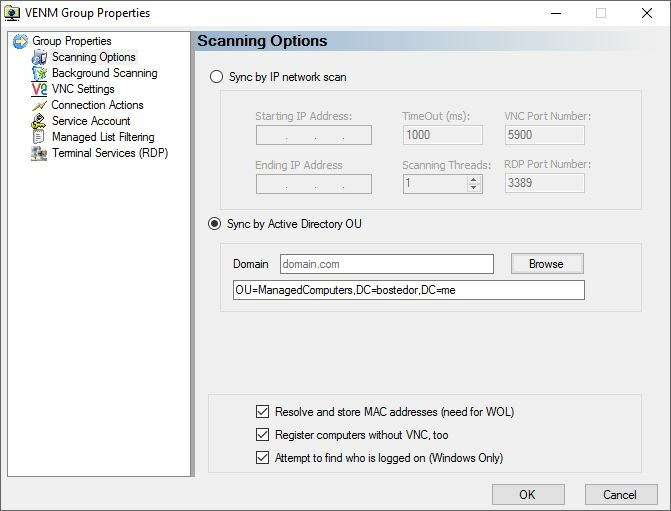 If the group properties is configured to sync by IP scan but you do not enter an IP address range, the scanner will just re-scan the existing computers in the group for VNC, RDP, and Ping. This entry was posted in Announcements, how-to, howto and tagged RDP Manager, remote desktop manager, scan vnc, venm, vnc active directory, vncscan. Bookmark the permalink.